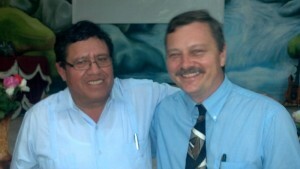 Pastor Mariano Yuquilema and Chris Owens celebrate the start of a new study center in Pastor Yuquilema’s church. Last night was a tremendous way to bring our trip to Ecuador to a close. Chris Owens, Pablo Moncayo and Bob Reed were privileged to attend the opening of another study center in Ecuador. Approximately 40 students registered to begin studying at Seminario Bautista Panamericano. Bob presented an overview of their studies and encouraged them to study faithfully to the end and then Pablo Moncayo, our Ecuadorian representative, walked them through the details of the program. Chris shared a message to focus them in the purpose of their studies and then they received their material. It was a blessing to see their enthusiasm! Thank you for praying for us. God has heard and answered you. Watch the short video below for a brief overview of the trip from Chris Owens, president of Global Baptist Schools.